We’ve come to depend on the 802.11 standard for Wi-Fi so much that it’s easy to forget it’s over 20 years old. When the standard was first introduced, users and vendors hadn’t envisioned it to be the foundation of many business-critical apps (think VoIP, SaaS applications, IoT devices and more). Today, however, as soon as customers or partners enter the corporate premises, it’s not long before they are asking to login to the guest Wi-Fi network to carry out the business that brought them there. We've quickly converted from a world where Wi-Fi was a "nice to have" to a "must have." Just as many industries have taken a mobile-first approach to application development, network engineers are starting to adopt a "Wi-Fi-first" approach to networking. Soon, the majority of network engineers will have never lived in a world without it. Since the introduction of 802.11, new generations have primarily focused on increasing data rates but, over time, it has become a game of diminishing returns that is unable to keep up with the increasing numbers of devices and applications on the networks. The following diagram shows you how the speeds have been evolving over the years. 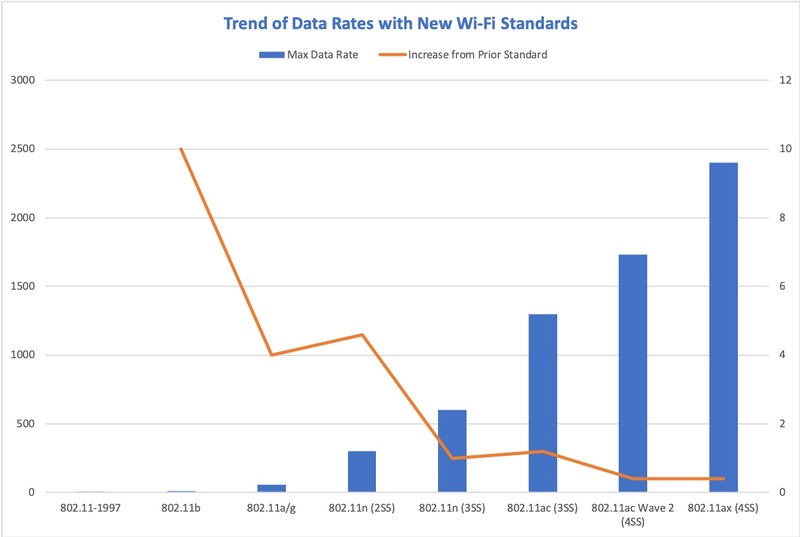 When the next generation arrives in Q3 2019, 802.11ax or Wi-Fi 6 (Wi-Fi CERTIFIED 6™) will address a more significant problem. Today, it's not just about speed; it's about the device density, which requires better spectral efficiency. Enterprises today are not only struggling to keep up with the increasing number of devices that connect to wireless networks but also to manage them in ways that reduce costs, automate operations and resolve problems faster. Density issues go much deeper than thousands of attendees trying to access the wireless network during a crowded event in a small space (think the keynote at an industry conference). The proliferation of Internet of Things (IoT) devices combined with the vast volumes of data spawned from digital transformation and the soaring number of rich media apps (augmented reality, data analysis) has the potential to cripple enterprise networks designed primarily for coverage instead of capacity. Organizations are also utilizing Voice over IP (VoIP) and video teleconference services as a primary means of communication, which also puts a strain on the network. 802.11ax addresses these issues by delivering theoretical data rates up to 5.4 Gbps with eight spatial streams (8SS), if one limits oneself to usable 80MHz channels in the 5GHz band and 20MHz channels in the 2.4GHz band. The use of wider 160MHz in the 5GHz band and 40/80MHz in the 2.4GHz band isn't realistic for a real-world deployment due to co-channel interference when the number of available channels is small. 802.11ax delivers increased capacity and reduces network congestion with increased efficiency. While few vendors have already introduced 802.11ax access points, network engineers may start to feel pressure to upgrade networks to benefit from these new capabilities. This pressure will increase as client devices with 802.11ax-compliant radios begin shipping in late 2019 to 2020. It’s not a question of if you should make the move to the new standard, it’s a question of when. Here are a few things to help decide when it should be done in your enterprise and why you shouldn’t necessarily be rushing to upgrade or delaying rollouts to wait for 802.11ax. Wi-Fi 6 Standardization: At the time of writing this article, the Wi-Fi Alliance has yet to release its Wi-Fi 6 interoperability certification but has stated that it will be coming in the third quarter of 2019. Customers should be weary of deploying early products unless their vendor can provide assurances that the product will be software upgradable to support the eventual standard. 802.11ax Configurations: Like many of the prior 802.11 standards, it is widely accepted that we will see multiple phases or configurations of products. Early products will ship with a varying set of 802.11ax features (Target Wait Time, MU-MIMO, OFDMA, BSS Coloring, etc. ), with many lacking support in the initial products. We are seeing this from vendors who have released products to the market already. Additionally, we will see early products ship with the same spatial stream support as 802.11ac (4 Spatial Streams), while products that are released later in 2019 may start to be available with up to 8 Spatial Streams. Wi-Fi Lifecycle: Most industries upgrade wireless networking gear approximately once every five years. For select industries, like education, it’s sometimes even more aggressive at three years. If you recently upgraded to the current standard and performance is acceptable, you probably don’t need to be on the bleeding edge of 802.11ax adoption. If your wireless networking gear is approaching that four- or five-year mark, you may want to be more aggressive in migrating to 802.11ax. Industry Adoption: Industries including retail, healthcare, and manufacturing will require hardened devices to benefit from 802.11ax. These capabilities will come a bit later down the road. IoT: There are expected to be over 20 billion IoT devices by 2020, with nearly half being wirelessly connected. As such, heavy users of IoT will want to start planning for 802.11ax. New capabilities include Target Wake Time that will help optimize IoT battery life. Regardless of when you migrate to 802.11ax, have the right plan in place. Capacity planning and design considerations will be similar to previous generations since the physical RF layer is common across both technologies in the 2.4GHz and 5GHz bands. When looking to migrate, start in higher density areas and test before upgrading all access points. It is also critical to make sure everything is fully backward compatible since the industry predicts a long wait before 802.11ax clients make up the majority of the client landscape.